This interview took place on: 11/10/14. JFH (Christopher Smith): You guys have been making music together for 10 years. Can you tell us about some highlights from the journey? Matt MacDonald: Highlights… man, I would say just getting signed. Tooth and Nail records was a big highlight. 2005. We all were just really hopeful for our careers. Everything just seemed to be going really really well. Playing Warped Tour. We played on the same stage as Katy Perry everyday; that was pretty funny. Going independent again was a big highlight, like being able to raise all the money we needed to raise to make a record on Kickstarter was huge. Yeah, there's a lot of highlights. A lot of ups. And a lot of downs. JFH (Chris): What is the significance of the album artwork on What Was Done? Matt: Well it's a tipping chair. The idea is that it's very present. It's a moment in time. That's kind of what we did with this album. We kind of froze ourselves for a minute to look back. I don't know. I kinda think that it's a little bit like the spinning totem at the end of Inception. Does it keep going or does it stop? Does the chair fall or does it tip back up? We don't know, but we are here in this moment and we want to recall the journey we've been on. And so it's sort of a freeze frame. There's a bit of a tension between the future and the past in that. That's what kind of drew us to that artwork. JFH (Chris): Very cool. How did you like the process of fans suggesting and voting on a couple songs for the album? Matt: It was great! I really feel like when you crowd-fund on an album, I feel like [the fans] have a voice because it's not just us putting out a product. They're actually helping us to do it. It was nice to give people a voice as far as what we would put on the album. Some of the songs that they picked were not songs that I would pick, but at the same time, I really like how they turned out. It forced me to re-record some of those songs that I didn't necessarily want to, but I'm happy with the result. So it's definitely a group effort when you crowd-fund and that's what it essentially came down to for us. JFH (Chris): How were the rest of the songs chosen? Matt: We picked them based on what we thought people would want to hear and what we would want to re-do. So some songs, like "We All Look Elsewhere" is one of them where I always had this sort of orchestral symphonic cello driven version in my head since I wrote the song. For years and years, I would consider it this way and think about how it would be cool to do it that way one day. That's one song we kind of picked and said "let's do it." Other songs we thought would translate well in the acoustic format. Also there are songs that we feel like people would want to hear, so we chose to re-do those based on that. JFH (Chris): Speaking of "We All Look Elsewhere," that song was given a complete overhaul, like you said, with the cello and everything. How did you decide between doing that and doing more of the traditional acoustic arrangement, like "My Name" for example? Did you have an idea of what you wanted for each song? Or did you just try to experiment until you were satisfied? Matt: Well, for some of them, we had an idea and some of them we experimented with. If we didn't have an idea, we just kind of jammed them until we did. We kind of had an idea of what songs we wanted to do and then some songs we felt like didn't work and so some songs we felt did better, so we kind of went with those, cuz ultimately it's about making a quality product and not just doing things because we want to do them. So yeah, the ultimate goal was to create something that was unique and different from the original, but that still had value as far as you could listen to it more than once. 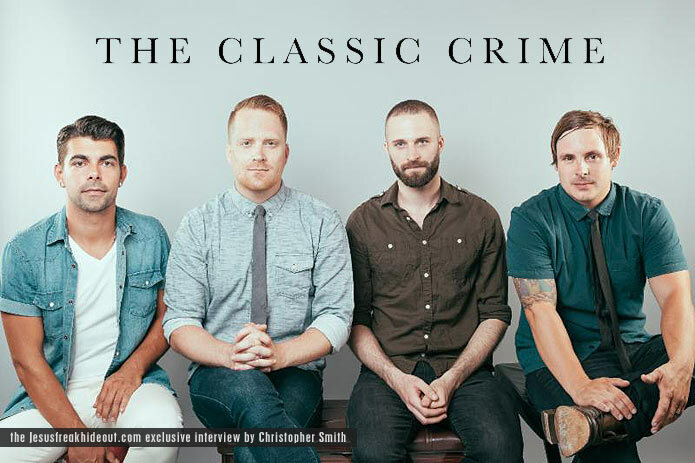 JFH (Chris): It's clear when listening to this album that you guys had a lot of fun trying different instruments that you wouldn't usually try on a Classic Crime album. Were there any instruments that you or any of your bandmates were particularly excited to try for the record? Matt: Yeah Skip, our drummer, played hand drums, which were like bongos essentially. I played a lot of tambourine. We played glockenspiel. I played some of that. Skip played some of that. We played vibraslap... certain things that we would never normally, or haven't done a lot of in years past. We were kind of able to experiment and have fun. That's kind of the fun about doing a record like this is that you're not trying to do a continuation of what you've already done, you're trying to do something completely different and so you get the opportunity to kinda experiment with different things you wouldn't normally experiment with. It turned out pretty good, I think. JFH (Chris): Yeah! What's the story behind "Where Did You Go?" Matt: The story behind the song... let me think about that. I think the verse is from a human perspective as far as feeling inadequate and doing life alone and feeling like no is really there to help you. And the ending of the song is sort of the voice of God saying: "I don't care where you've been. I don't care how far you've run. Just come home." I guess it's sort of like a redemption story. Even though you don't feel like life has value or purpose in the end, from a different perspective, it absolutely does. And that's kinda what the song's about. JFH (Chris): Yeah it has that Prodigal Son kind of story to it. JFH (Chris): You opened up to fans about your struggles with the recording of "Who Needs Air," saying: 'What can I do to this song that hasn't been done? How can I capture it in a different light? How can I make it intriguing enough, 11 years after its conception, to convey the emotion with which it was written?' Do you think you accomplished all this in its final recording? Matt: Yeah, I am really happy with the final recording. I think that it turned out really well. I think I was overthinking it to begin with, thinking we gotta add this or we gotta add that, but ultimately I think the song spoke for itself with just an acoustic guitar, a vocal, and a cello. And I think the cello was sort of a last minute deal that I decided to add at the very end and I think that took it to a different level than we would have otherwise thought. That might have been the fifth or sixth time we've recorded it as a band. Even though we haven't released it that many times, that's how many times I've been through the studio to create it. I wasn't too happy about doing it again, but I was happy with how it turned out. JFH (Chris): Yeah I loved it. It was actually one of my favorites off the album. JFH (Chris): You guys recorded the whole album in your garage. What was that experience like of constructing your own studio? Matt: Well, it was good in a way that we didn't have a time limit. And it was bad in a way that we didn't have a time limit. I mean, ultimately, we wanted the freedom to create and the freedom to express and the freedom to take time thinking about our parts. To do that in a studio setting where you have to pay by the hour is just not feasible. So we were able to do that at home and I was able to work in my separate garage everyday for six months just working on things. And it was good in that we were able to do a lot of things we wouldn't normally be able to do and, at the same time, it was bad in that it took forever. *laughs* When there is no time limit, it definitely adds to how much time you spend. So that's kind of what happened. We ended up spending a lot more time than we thought we'd want to spend, but ultimately, it's about the end result and I think [it's an] end result we're all happy with. So I think the end justifies the means. JFH (Chris): You get what you put into it, and it sounds great. JFH (Chris): So you guys put together the rewards for Kickstarter and shipped them out yourselves. Is that correct? JFH (Chris): What was that process like? Matt: Well, we like to create rewards that we think everybody would be into and that we would find fun to fulfill. Some of the experiential ones and stuff we just liked to do we thought would be a cool idea. We also feel like we want to honor the people who back us, and so things like your name in the album credits and really unique sort of test press things and stuff like that are cool things to really honor the people who have backed us at a higher level. Mostly, it's just about trying to create packages that we think people want, because we don't want to try to sell people on something they don't want. We're hoping that when we create these packages that people will look at that and go "Wow! That's an incredible deal to be part of this project on this level!" That's kind of our main focus. JFH (Chris): How did you get involved with BadChristian? Matt: We've known the guys for a long time. Matt from Emery lives in Seattle. We've met a few times and talked about releasing independent music. And I was kind of doing a lot of things on my own for the Classic Crime, as far as the label side of things. When he started BadChristian, he wasn't thinking it was gonna be a label. He was thinking it just gonna be a sort of a brand that represented a certain segment of the culture that was under-represented at the time. And when it came to music, we thought: "Well, we need to also release music that represents what we do." I say "we" because I was kind of helping Matt and Toby set up the label side of things and having them release their independent records and release other independent records. So when it came time for our band to release a record, we had set up all these systems and processes that were really efficient and worked well, and it sounded a lot better than me just doing it myself. So it just sort of made sense to partner with them to get the record out. JFH (Chris): "Volume 1" suggests a possible follow up. Has there been any talk of doing a Volume 2? Matt: Yeah, we hope so. We hope we don't make a habit of just putting out volumes of old songs that we've re-recorded, but at the same time, we hope that we can put out more and more of these renditions as people desire them. If people like them, we want to do more of it. We also want to leave the option of more songs that we haven't previously done and a lot of people had ideas of what they wanted to hear, so we kind of want to leave that open ended as far as what we can come back and re-do. JFH (Chris): You guys are doing a tour with Emery this month. Is there any city or venue that you are particularly excited to play in for the tour? Matt: Well we are in Houston right now at a bar. But we will be in L.A. at the Whiskey, so that's pretty fun. It's a pretty classic venue for rock music. I've played there just acoustically a few months back but we haven't played there as a band, so that's kind of a milestone to play at the Whiskey in Hollywood. JFH (Chris): Cool. Last Question. Any more Vocal Few material in the works? Matt: Always! I'm trying to do Vocal Few in between every Classic Crime release. I've got nothing written right now, but I'm hoping to work on that when I get home. The Classic Crime's latest album, What Was Done, Vol. 1: A Decade Revisited is available now wherever music is sold!